Zoom in with the power of a superb 28x optical zoom NIKKOR glass telephoto lens and capture detailed close-ups of faraway action. Vibration Reduction (VR) keeps your photos sharp and your videos steady—especially useful with such a long lens. And when you need more reach, Dynamic Fine Zoom, an enhanced digital zoom function that effectively doubles your reach, increases the zoom range to 56x. Create beautiful high-resolution photos and videos with ease. The COOLPIX L340's high-performance NIKKOR glass lens is paired with a 20.2-megapixel CCD image sensor that captures bright, vibrant images you'll love sharing. 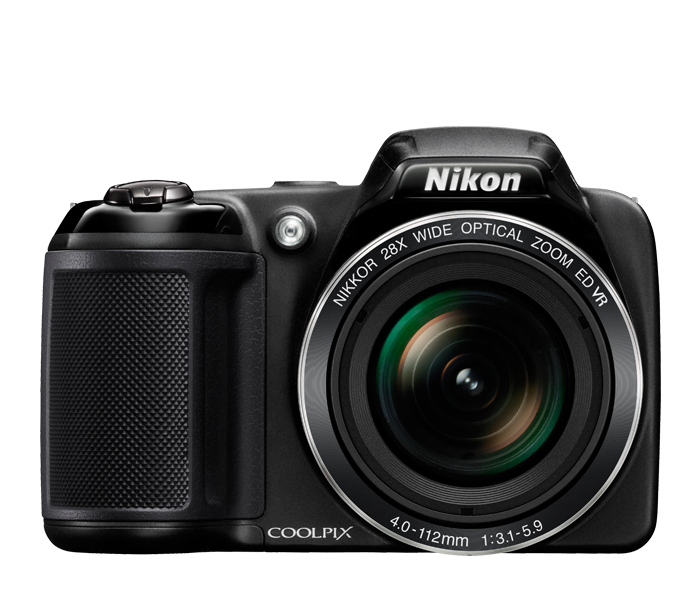 You will feel a difference when handling the COOLPIX L340 for the first time. Its ergonomic design fits comfortably in your hands and puts key controls like zoom and Movie Record right where you want them. This makes for more stable zooming, framing, shooting and video recording, and it means you won't have to take your eyes off the large, bright 3.0" display while you're capturing memories. Easily match your situation to one of 16 Scene Modes like Beach, Snow, Night Portrait, Sunset and more, and enjoy effortless great shots. Or, choose Easy Auto Mode and let the camera choose for you. The COOLPIX L340's large, LCD display makes it easy to compose your shots or monitor your video recording. Reviewing and sharing your creations is a pleasure, too—every shot looks fantastic on the display. The COOLPIX L340 is powered by Four AA batteries, which are convenient to use, and widely available. It accepts alkaline, lithium and Nikon rechargeable batteries, available as an optional accessory.